What place does anger have in public life? Should we welcome the expression of anger in our elections and political deliberations, or does the common good depend on the existence of political institutions and processes from which anger and other strong emotions are excluded? Has the failure of those institutions and processes prompted much of the acrimony, hostility, and rage that we have witnessed—or felt—in this election cycle? And is it possible that the theater might shine a light on something important about such questions that we might not discover by other means? On the eve of a historic election, the Institute for Humanities Research (IHR) at UC Santa Cruz—in collaboration with the Humanities research group Shakespeare Workshop—will present a public conversation about anger and politics, from Shakespeare to Donald Trump. It all takes place on Tuesday, October 18, at Kuumbwa Jazz Center in downtown Santa Cruz, beginning at 6 p.m. Titled Anger in Politics: From the Bard to the Donald, this special event is part of the IHR’s Questions That Matter series, designed to bring together UC Santa Cruz faculty with community residents and students to explore the big questions that matter to all of us. The series is a part of a strategic initiative of the IHR to illustrate the role and value of the humanities in contemporary life. The panel will feature Sean Keilen, associate professor of literature at UC Santa Cruz, provost of Porter College, and director of Shakespeare Workshop; Deborah Gould, a UCSC associate professor of sociology who studies political emotion—from hope and anger to cynicism, resignation and despair; and Daniel Wirls, UCSC professor of politics, and an expert on American politics, institutions, public policy, and political history. Keilen explained how the event came about and the connection between anger, Shakespeare, and Donald Trump. Coriolanus is the only play that Shakespeare set in a republic, Rome, which is under siege by foreign enemies. Because its resources are shared unequally by the upper and lower classes, the Roman Republic is also on the verge of civil war. In this setting, a man named Caius Martius Coriolanus--famous for his prowess as a soldier and infamous for his anger toward the poor--stands for election to Rome's highest office, the consulship. Keilen, a former Guggenheim Fellow, who is working on a new book titled Shakespeare and the Future of Literary Education, reflected on the anger he sees in the political arena in 2016. “Speaking only for myself, I believe that the anger permeating public life today is caused by the conspicuously unequal distribution of wealth and privileges in our society; by a succession of governments that have consistently failed to address this inequality; and by news organizations that fetishize trivial celebrity scandals and routinely fail to hold governments accountable for doing nothing to improve the conditions of life and work for everybody,” said Keilen. “However, as a teacher and scholar, I would add to this list the significant changes that have occurred, since I was a student, in the way that our society perceives the value and purpose of education,” he added. Keilen noted that the anger expressed during this presidential election cycle has been useful to the extent that it clarifies what some of our most persistent problems are, but as one of his students pointed out about Coriolanus, anger is completely incapable of solving the problems that it brings to the surface. Keilen observed that there are both huge costs and benefits as a result of this anger. But in a world of quick judgments, instant sound bites, rabid opinions, and fierce partisanship, Keilen believes that asking questions about the role of anger in politics really does matter for the future of the country. Sean Keilen is associate professor of literature at UC Santa Cruz, provost of Porter College, and director of the Humanities Research Cluster, Shakespeare Workshop. He studies Shakespeare and the history of criticism. A former Guggenheim Fellow, he is writing Shakespeare and the Future of Literary Education, a book about reading, the vocation of teaching, and the importance of the humanities and arts. Deborah Gould is an associate professor of sociology at UC Santa Cruz She is interested in political emotion, from hope and anger to cynicism, resignation, and despair. She is currently working on her second book, Emotional Terrains of Activism: Appetites, Encounters, and the Not-Yet of Politics. Daniel Wirls is a professor of politics at UC Santa Cruz. He is the author of The Federalist Papers and Institutional Power, Irrational Security: The Politics of Defense from Reagan to Obama, and The Invention of the United States Senate. He is currently working on a critique of the Senate and an analysis of the consequences of post-9/11 policy choices on the structure of American politics. 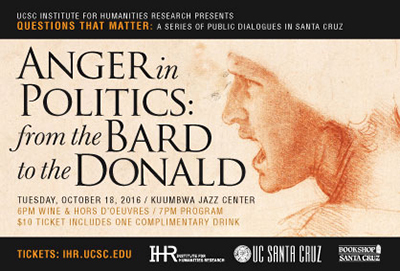 The Institute for Humanities Research (IHR) and Shakespeare Workshop at UC Santa Cruz will present “Anger in Politics: From the Bard to the Donald” on Tuesday, October 18, at Kuumbwa Jazz Center in downtown Santa Cruz. Doors open at 6 p.m. for wine and hors d’oeuvres. The program begins at 7 p.m. Tickets are $10 (includes one complimentary drink). For more information and tickets, go to http://ihr.ucsc.edu/event/anger-in-politics/.